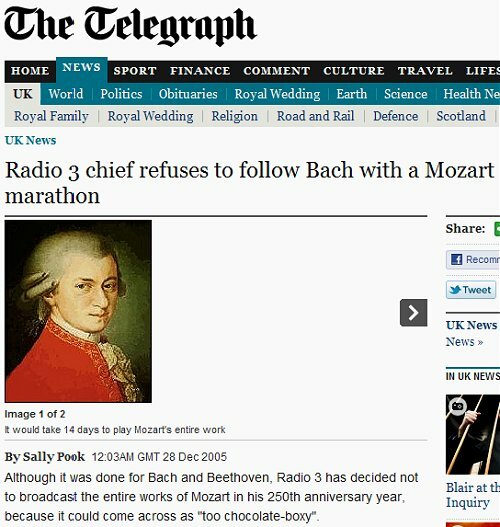 Our view is that with Mozart end to end, the overall effect would be detrimental to the music ... The music could wrongly be seen as slightly more chocolate-boxy than it really is. Which leaves me wondering what to do with this story. If I say anything else my inbox will be groaning with the usual anonymous accusations of another "predictable diatribe" and pursuing an "anti-BBC agenda". But there again, do I need to say anything else? I knew I remembered that promise! I recall Tchaikovsky was indulged shortly afterwards, but specifically no every note. Shame, I always can do with more Tchaikovsky. During the Mozartival, I found myself retuning to Radio4 more-and-more. As for the Bachathon, it was odd listening to St. Matthew's Passion at Xmas, and after the 52nd cantata, it became a little bit too much like living in a fruitcake. Alec, my experience is exactly the same as yours, I find myself listening to more and more BBC Radio 4. It seems to be the one UK network where ego has not yet replaced integrity. I've been grieving for What Was on Radio3 ever since they scaled-back on Late Junction (the departure of Verity is a different loss, with only the retention of Fiona - can a man love too much? - saving me from total despair).